Interview with Vicki Gold Levi How did you originally get involved in writing this book involving Cuba? My original involvement is very curious. I am an Atlantic City historian (my home town) and I was looking for information on an Atlantic City icon, the high diving horse. The horse and a rider performed daily on the Steel Pier, an amusement center out to sea. There was a letter on Ebay written by a rider, Sonora Carver, while she and the horse toured Cuba (probably in the 1930s.) 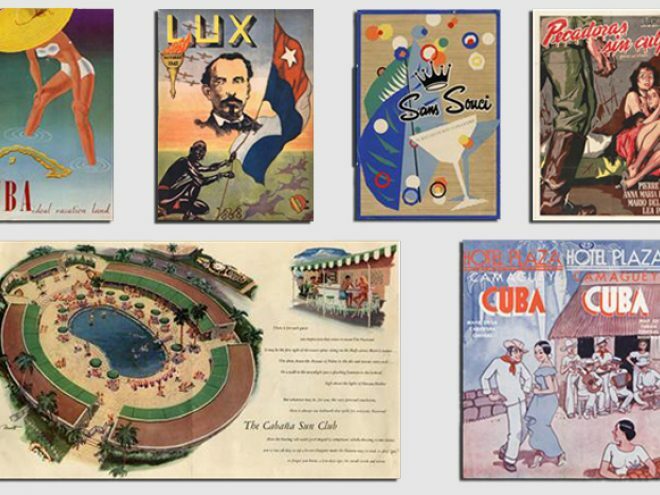 While on the Cuba Ebay page, I was immediately taken with the vibrant designs of Cuban ephemera that were being auctioned. I just started to collect them, and while working with Steven Heller on another project on Las Vegas vintage graphics, I showed him my collection and he immediately realized both the quality of the graphics and their historical value . The rest is history! What was the driving motivation behind the preparation of this book? My collaboration with the talents of Steven Heller, my co author, and the greatest expert on design and graphics in America today, and his wife, Louise Fili the talented designer and art director, were pivotal in the book being sold and looking so beautiful. They have a pure and esthetic way to present the material, so the design of the graphic is what the page is about. I was not so familiar with Cuba before my accidental introduction on Ebay. Of course I knew about the Bay of Pigs, Castro, Che Guevara and Elian Gonzales. I remembered the music of Cuba, like the mambo and cha cha cha from my youth., and of course, Desi Arnaz! But I was not as familiar with her history, culture and dedication to the arts, (ballet, music, theater, photography and painting.) Visiting Cuba was a revelation to me and I developed a great caring for its people and its future. How would you describe the key tenants of this book? The graphics and photos were all collected from a period before the Revolution that catered to tourists, especially Americans, and were used to lure visitors to the island for purposes of pleasure and excitement. Do you have a favorite extract or story or anecdote from the book that illustrates a key message or theme from this book? One time, when I was in Cuba giving a lecture at the world’s conference on art deco, I showed xeroxes of some of the graphics in Cuba Style. The responses were overwhelming. People were so delighted with these images that they had hardly ever seen before, and they would literally kiss my hand in affection and gratitude. Cuba is now valuing more of their past before the Revolution, and seeing these images in a much more positive light as part of their cultural history. I think our book may have contributed to making this possible. Also I had never seen in my earlier research the brilliant work of Cuban illustrators on the covers of magazines such as Carteles, Bohemia and Social. When I first discovered these works, I was overwhelmed with the sophistication and artistry of these illustrators- especially the brilliant work of Conrado Massaguer. Included these illustrations was a high point for both myself and Steven. I visited Cuba twice for my work, and was totally taken by the people of Havana, their commitment to the arts, their general good will and sense of humor. Even though the infrastructure is somewhat worn, the city itself retains its beauty and its people are hopeful about their future. Vicki Gold Levi is a historical picture editor, photography curator, and author who has worked for Esquire , Mirabella , and New Woman . Co-founder of the Atlantic City Historical Museum, she lives in New York City. Steven Heller is the art director of the New York Times Book Review. He is the author of over ninety books on graphic design, popular art, and satiric art. He lives in New York City.